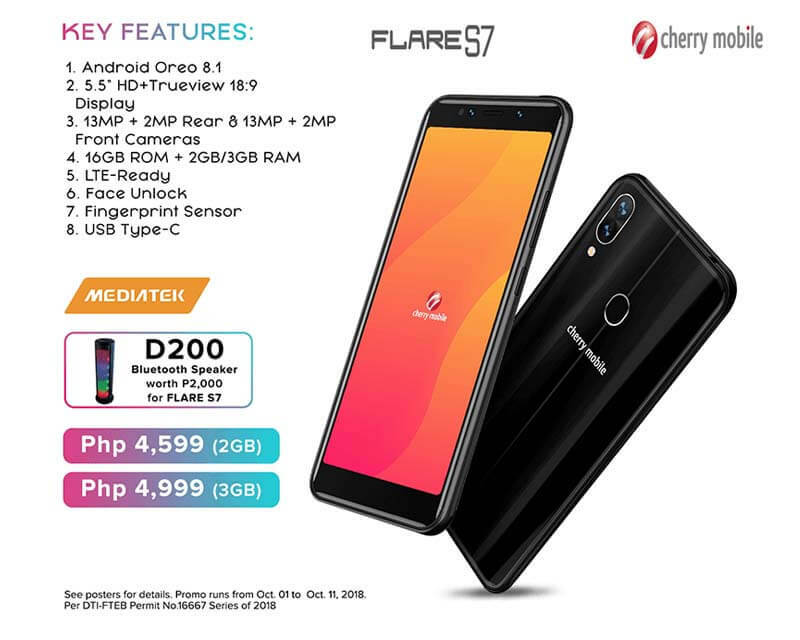 Cherry Mobile recently unleashed their new smartphones under Flare S7 series after being quiet for the past months. You can now start filling up the pre-order form available on their Facebook page if you want to be the first to experience the brilliance of these devices. Let’s start with the standard model of Cherry Mobile Flare S7, it has two variants that only differ on memory specification. You have the option to choose from 2GB of RAM that only cost you ₱4,599.00 and the 3GB version priced at ₱4,999.00. The Flare S7 features two-camera setup with a 13-megapixel and 2-megapixel on both rear and front. It sports a 5.5-inch HD + Trueview 18:9 aspect ratio screen and powered by 1.3GHz quad core MediaTek MT6739WA processor. You also have the USB Type-C, Wireless charging and Fingerprint security features. You can pre-order S7 starting October 1-11, 2018 and get free D200 wireless Bluetooth speaker that is worth 2,000 pesos. Below are the list of participating Cherry Mobile concept stores for the pre-ordered units.